Often called plantar warts, verrucas develop on the soles of the feet and can be quite painful when you stand on them. Whilst harmless to your overall health they can be unsightly and are slightly contagious, which means you can catch them off surfaces like swimming pool floors, where people walk around barefoot, or from close contact with someone who has been infected. They are one of the most common viral infections and people generally don’t notice until there is a little discomfort or pain. Warts and verrucas are caused by certain types of human papilloma virus or HPV. They get into the skin if you have a small scratch or cut or have wet feet, for instance when you visit a swimming pool. Once the virus is in place it can take weeks or months before it begins to show as small lump with a tiny black dot in the centre. Verrucas can be difficult to get rid of and people often suffer in silence for a long while before they ask for professional advice from a chiropodist or podiatrist. Treatments in the past have included solutions that contain salicylic acid (an active ingredient of aspirin) or, in more extreme circumstances, freezing and removing surgically. If all the virus is not removed, however, there is a chance that the verruca can reoccur within a few weeks or months. How Does Spirularin VS Help? One succesful product on the market at the moment is Spirularin VS. We have found it to be an effective solution to the perennial verruca problem and currently use it in our clinic. Spirulina Platensis is one of the oldest living organisms on the planet. The key to this as a treatment is that these microalgae have some pretty nifty defence mechanisms when dealing with threats such as bacteria and viruses. In addition, Spirulina microalgae have properties useful for damaged skin that help promote cell growth and regeneration. That means this product, which contains a patented extract of the Spirulina Platensis, helps to kill the virus that causes the verruca and then promotes repair of the skin that has been damaged. 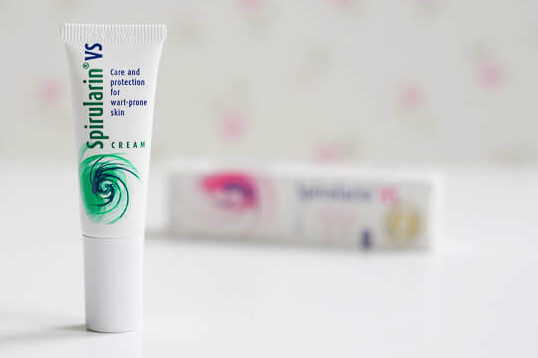 Spirularin VS is available as a cream that can be applied to the damaged area, working to destroy the virus and ensure future infections do not occur. Verrucas are particularly problematic for those with diabetes who need to seek the help of a professional chiropodist or podiatrist to treat any infection or problem involving their feet. There are no known side effects from using the cream and it is safe for everyone, including children and diabetics. One problem with alternative treatments is that the verruca tends to return after a period because the virus has not been totally removed. With Spirularin this is rarely seems to be the case which is why we offer it as a treatment in our clinic at Beauchamp Foot Care. If you have a verruca and would like to find out more about this simple and effective treatment, then give us a call today on 020 7225 0794.